Synopsis: Devi is gifted with Extra Sensory Perception (ESP). Her gift comes to light one day while playing tennis with her friend, Sudha, when she has a vision of her sister, Rama, being shot to death by a man in a black raincoat. She telephones Rama, finds she is safe and is relieved. Shortly thereafter Rama disappears, the police are notified, but are unable to find any trace of her. Devi then meets multi-millionaire, Ram Kumar, both fall in love and get married. She moves into his once abandoned and legally disputed bungalow, and that’s when she starts having visions again. These visions lead her to a wall that is loosely plastered. She breaks down the wall with a pick-axe and finds a skeleton of a woman, who is later identified as Rama. 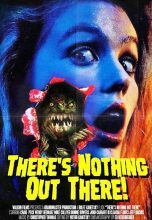 Now having come to know that her premonitions are more or less accurate, Devi starts to have another vision – this time of a woman being stabbed by a bald man. 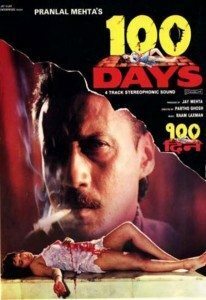 Together with Ram and her friend, Sunil, Devi attempts to unearth the truth, which can be found only on a video cassette marked “100 Days”, knowing fully well that she may well be the next target of an unstoppable assassin.